I am writing this column at the earnest pleading of my very successful New York City banker friend, Mr. Felix Otoo, who bitterly complained to me just this afternoon that those writers who have rejoined the series of tirades written and published by Dr. Valerie Sawyerr have, so far, not been able to punch back as hard as they could or ought to. Well, my initial response was that, that foulmouthed virulent critic of Mr. Martin Amidu had a remarkable flair for the language, but clearly lacked the requisite gravitas or mature-adult temperament that goes with tackling the discursive issue at stake. I also responded that I was reluctant to weigh in on the fray, because I did not want to find myself indecently flogging a dead man, which was precisely what the former Mahama Deputy Chief-of-Staff Second-Bananas appeared to be unwisely asking for. And then after taking a much-need nap later in the afternoon, I decided to weigh in on this National Democratic Congress’ ado about absolutely nothing running fit of conniption and despondency crudely packaged as righteous indignation. You see, dear reader, I did not want to weigh in on either side of the fray because absolutely no amount or decibel-level of kicking and screaming by these clueless NDC party-machine operatives who are running scared-stiff of the auspicious and opportune appointments of Mr. Martin ABK Amidu can stop the inexorably onward moving clock and train of justice. Then, also, I did not want to be seen butting heads, needlessly, with my moral and intellectual subalterns. Indeed, even as I write, two of the SADA (Savannah Accelerated Development Authority) ethno-regional gravy train established by a pathologically corrupt former President John Dramani Mahama have just been sentenced to prison terms ranging between 6 and 10 years, if memory serves me accurately on the latter count. But, of course, what I wanted to establish beforehand, at the beginning of this column, is the fact that the virulent Martin Amidu critic has absolutely no credibility, whatsoever, to warrant my waste of precious time and cranial resources shadow-boxing this political and moral basket case. You see, the last time that I responded to one of her coldly calculated mendacities, Dr. Sawyerr had accused the Akufo-Addo-appointed Head of MASLOC of having criminally caused financial loss to the state. And then when the accuser was strongly challenged to substantiate her allegations against the MASLOC Chief, Dr. Sawyerr simply slipped under her bed covers, whined about experiencing some excruciating menstrual pangs and discharge, and hurriedly vamoosed with her two hands cupped over her crotch. I would not be the least bit surprised if her former boss turns out to have secretly interceded on her behalf, because I had advised the MASLOC Chief to slap her heavily over her pate with the judicial gavel. And for the benefit of those readers who may have so soon forgotten the same, the self-ordained Martin Amidu gadfly has been widely accused by some constituency executives and party operatives of the Greater-Accra National Democratic Congress of either having withheld funds or embezzled funds meant for distribution to them in facilitation of the successful reelection campaign of former President Mahama in the lead-up to Election 2016. As far as I have been able to gather from our local media fare, the former Mahama Deputy Chief-of-Staff Second-Bananas has yet to offer her accusers any convincing self-defense. Chances are that she has none to offer. Not that it matters to me, anyhow, even though I would very much welcome a probe by our newly-named Independent Special Prosecutor into this allegation, because the party on whose behalf Dr. Sawyerr was instructed to divvy up the missing electioneering-campaign dough is taxpayer supported. This may clearly be one reason why Dr. Sawyerr has been desperately seeking to seriously dent the image, credibility and hard-earned reputation of Mr. Amidu. Fat chance, I say! 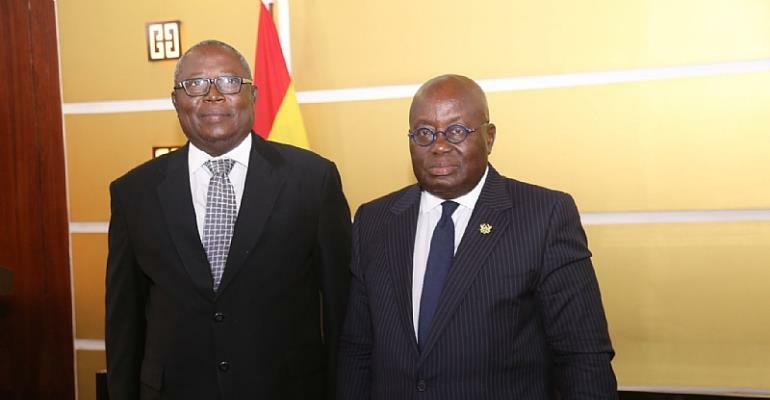 You see, anybody who thinks and believes that the former Atta-Mills running-mate stands shorter than the late President Mills, by any stretch of the imagination, must be living in the proverbial Fool’s Paradise. That person is, obviously, afflicted with clinical dementia and needs to promptly seek psychiatric examination. I mean, we are talking about a visibly ailing man who publicly stood before the media and the Ghanaian public at large and vehemently and shamelessly insisted, against common sense and the available viable forensic evidence, even then, that Mr. Alfred AgbesiWoyome owed the Ghanaian taxpayer absolutely nothing. Not a farthing, as it were. And that if anything at all, it was rather the Ghanaian citizenry who owed Mr. Woyome an inexhaustible debt of gratitude! You would have thought that an intellectual of Dr. Sawyerr’s learning would, by now, have recovered from whatever strain of dementia or high fever that had taken grips of her rational faculties and promptly apologized for the criminally egregious errors of her ways. This is what I find to be at once rather pathetic and tragic about the entire anti-Amidu propaganda campaign being relentlessly and desperately waged by some of the front-row members of the main opposition National Democratic Congress.